L’Oreal Paris nailed it this time in the eye makeup department. Every year L’Oreal Paris introduces new products in their Cannes collection, and this time they launched beautiful limited edition lipsticks, new shades of lipglosses and gorgeous Gel Intenza eyeliners. I couldn’t have been happier with the shades they have launched in their eyeliner. Blue is my favorite color and there are two super pretty blue shades in this launch. I am reviewing the shade ‘Sapphire Blue‘ here. 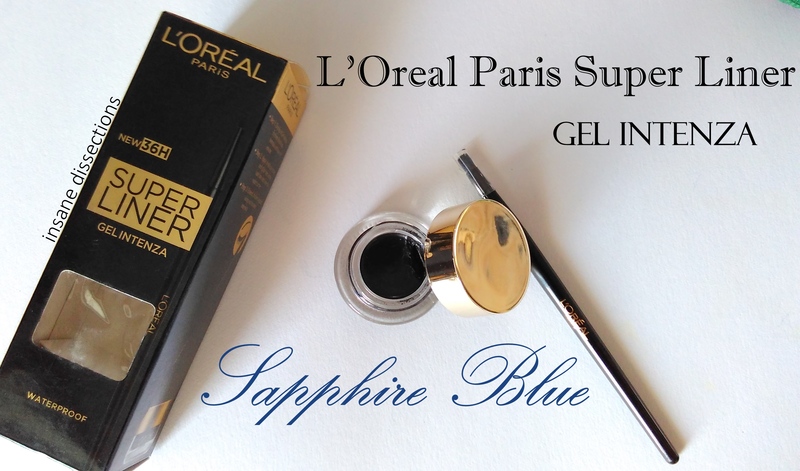 L’Oreal Paris Super Liner Gel Intenza eyeliner comes in a glass tub packaging with a gold screw cap. The gold accents makes it look pretty and high end. The tub is small and cute and looks sturdy even though it is made of glass. The bottom part of the tub has a sticker indicating the shade name and details for easier identification. The eyeliner comes with its own brush. The brush is okayish. It is decent but not that great. I can make thick lines with it but not thin lines. Also, the brush doesn’t have a proper cap. I prefer the Maybelline gel eyeliner brush over this. The texture of L’Oreal Super Liner Gel Intenza eyeliner is buttery smooth and creamy. So creamy that one cannot apply full color on the eye in one stroke as the product itself gets swiped with brush stroke. Other than that, it applies like a breeze. There is absolutely no tugging or pulling at all. The pigmentation is great. But due to the soft formulation, the brush somehow doesn’t pick up the product properly so you have to keep dipping it in the tub to take more of it. The brush either picks up very less or too much amount of the product. 2-3 applications are needed for full color intensity. The eyeliner dries pretty quickly into a smudge proof, water resistant finish. The shade Sapphire Blue is dark navy blue in color. It looks almost blackish with blue shimmer. It appears black only from far and under certain lights. The shimmer is subdued and doesn’t make it OTT. This is a great everyday wear shade and such a nice alternative to plain black eyeliners. I have mixed feelings for the longevity. It definitely will NOT stay 36 hours, as it claims. This product is not as long lasting as it claims to be. It claims to be waterproof but its not fully waterproof. Vigorous rubbing with a moist cloth or finger causes it to come off. It does not smudge or crease, but it tends to fade after about 8 hours especially near the inner corner of eyes. I remove the eyeliner with my Natio eye makeup remover. You can use any makeup remover or oil/vaseline to remove this. Another thing I noticed is the wrong color coding of both the blue Gel Intenza eyeliners- Royal blue and Sapphire blue. It seems that the colors on its packaging, even the names have been swapped. 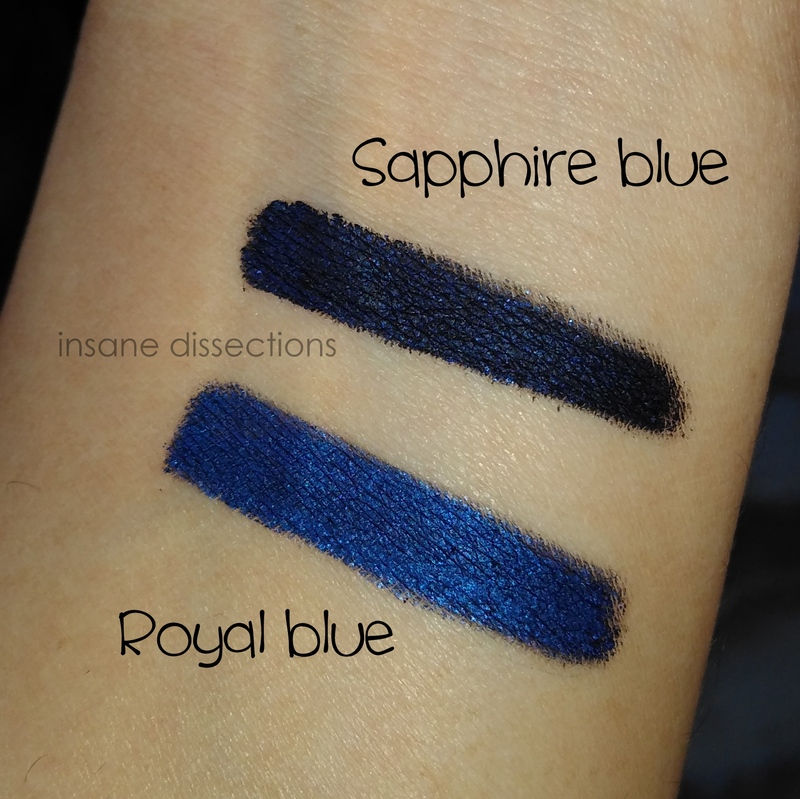 ‘Sapphire blue’ eyeliner is actually dark navy blue in color and ‘Royal blue’ is jewel toned blue in color. The color code of Sapphire blue shade on its cardboard packaging, as well as below the tub packaging is actually jewel toned blue and not navy blue which is the actual color of the product in the tub. This confusion led me to buy the wrong shade actually! Overall, this is a beautiful everyday wear color and such a fun alternative to boring blacks. The product is buttery smooth and application is such a breeze, even for a novice. The brush could have been better though. And I am not impressed with the longevity either. Even though it is bit pricey and the longevity issues aside, I am probably going to repurchase it once it gets over, mainly because of its gorgeous dark navy blue color.